While 2010 marks the 55th anniversary of CORUM’s founding by René Bannwart, this year is also the 50th anniversary of one of its most iconic collections: the Admiral’s Cup. To celebrate the event in due style, Corum has introduced a number of new models to the collection, including a Minute Repeater Tourbillon, as well as its first diver’s watch. Continuing the year with a flourish, the brand from La Chaux de-Fonds, is now opting for an original exercise in style by presenting the Admiral’s Cup Chronograph 44 Centro Mono-pusher, a timepiece equipped with a mono-pusher chronograph. Whereas the classic twin-pusher chronograph is the most popular sports-watch complication, the monopusher chronograph is a much less common and more refined variation reserved for more initiated customers. This complication with its single pusher serving to stop, start and reset the chronograph is generally associated with models featuring a more classic appearance. In tune with its tradition of innovation and originality, Corum has chosen to celebrate the 50th anniversary of the Admiral’s Cup by once again rowing against the tide and introducing this particular complication. 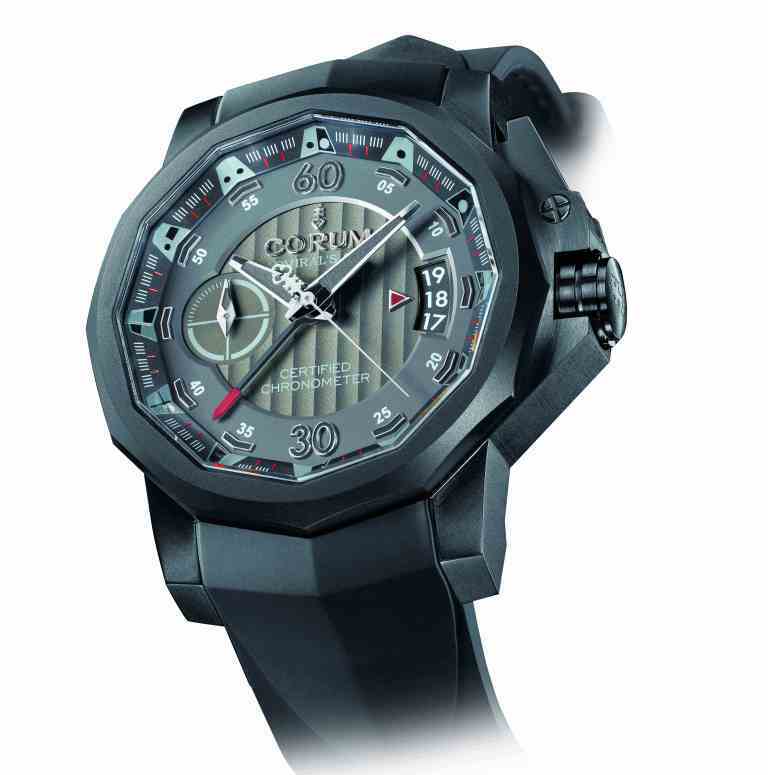 Thanks to the Corum-exclusive CO961 movement, the brand is even going a step further by deciding to rewrite the codes of the mono-pusher chronograph: the chronograph minute hand, traditionally placed in a dedicated subdial, is in this instance mounted on the same axis as the conventional hour and minute hands -hence the name “Centro Mono-pusher”. In addition to resulting in a timepiece with an original face that is extremely uncluttered for a chronograph, it is also patently more readable, especially since the chronograph minute hand has a particularly suitable design featuring a slender black base and a wider red tip.